In today's fast-paced society, things get so hectic we often get so wrapped up in work and adult responsibilities that we forget to enjoy the simple things in life. Other times, we think that creating family memories means spending money and let's face it, most of us are not Bill Gates with an endless influx of money that allow us the freedom to go wherever we want at any time. We are real people with real lives that require us to pay bills and buy necessities before considering going on a fun trip with our family. Sometimes fun is delivered right to your door and maybe you've been too busy that you overlooked it - or maybe not because let's face it sometimes fun comes in ways that also equal work. That's what happened for us over the last week. Not once, twice, but three times the heavens from above decided to grace our state with a beautiful blanket of snow. We didn't receive as much as other parts of the country, but there was definitely more than a dusting and plenty to have some fun with the kids. During the winter, we often find ourselves cooped up in the house trying to stay warm and maybe driving each other bonkers. I am not much for cold weather as I would prefer to snuggle up in a warm blanket with some hot cocoa and just stay put. My daughter had other plans in mind. She wanted to go outside and play in the snow. How could I resist her big blue eyes with her mile long eyelashes batting at me with that sad little look saying "PLEASE MOMMY". Thinking back, I remember my dad would NEVER let us play in the snow - he said we'd get sick. So as a child, all I remember is that I stayed inside looking out at the snow. That is not the memory I want for my children so I reluctantly agreed that we could go out and play in the snow. After digging around in the closet for my daughter's old pair of snow pants to see if they would still fit her (and thankfully they did), we suited her up in all the winter gear she would need to have some fun outside. 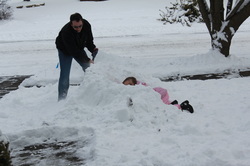 My daughter's first mission was to roll around on the ground and make a few Snow Angels. We decided it was a perfect day to make a Snowman. We had plenty of snow to work with; however, we were a little disappointed to discover that the super cold air had made the snow like powder and it wouldn't pack very well. A little light fluffy snow wasn't enough to deter me from making fun memories for my daughter. I'm pretty stubborn like that. So I worked and worked to try to make that snow pack and with some effort, we were able to roll a few small snowballs. My husband decided at one point to join us. He had misplaced his gloves so his ability to help was limited. 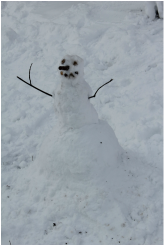 My daughter and I were packing snow around the seams of the snowman's body when he had another idea. Let's build a snow fort. My daughter was completely on board with this idea because that means snowball fight! So off my husband went to get the shovel and he began to mound and pat the snow he had cleared from the driveway. Before long there were two snow forts, one on each side of the driveway. The fun was limited as the snow still wasn't suited for making snowballs; however, we gave it the old college try and still managed to throw some snow around. We even managed to get my teenage son outside to join in on some family fun. There was lots of laughing and fun going on in the front yard that afternoon. It must have looked like we were having a blast because as some cars would go creeping slowly down the ice path that is our road, I noticed they would look over our way and smile. Yes, we were having fun and it showed. Fun doesn't always equal spending money. There are ways to help create fun memories with your family without breaking the bank. Sometimes it's just fun to step away from your responsibilities as an adult and outside your comfort zones to act like a big kid yourself. Your children will love that you're being silly with them and you're sure to have some fun! What are some inexpensive or no-cost ways you have found to have fun with your family? Another day another fun way to create wonderful memories with your children. This weekend's mission was to make time for the family even though there were several other comments in place that made this challenging. In addition to my daughter's ballet class and Nutcracker rehearsals, she also had a Girl Scout event to go horseback riding. Needless to say, fitting in a little family time this weekend was destine to be tricky; however, if there is a will there is a way.Saturday morning, we woke up to discover our refrigerator had conked out on us. Not the best way to start a day, but we made do with a trip to pick up breakfast on our way to the studio. Although it wasn't the most fun time, the family stopped by a local store to explore refrigerators together. Yes, it was a boring task, but it's good to involve the kids in the decision so they feel a part of something, right? Well maybe it wasn't anyone's idea of a good time, but it was a task that needed to be done. Sunday morning was much better. One of the ways our family has found to save money on entertainment is to purchase memberships to local attractions. Our recent renewal of our zoo membership opened the door to a great opportunity for family time this weekend. Our wonderful zoo was holding a Fall Festival and I decided before our Girl Scout horseback riding excursion it was important for the family to spend some time together. So after packing a few non-perishable food for lunch and getting everyone ready, off to the zoo we went. We decided to take two vehicles so we could part ways when needed and my husband could take our son out for driving lessons afterwards. Our first stop was a new exhibit I had promised my daughter and husband we'd stop at the next time we went to the zoo - Stingray Bay. Our local zoo is amazing and has created a new exhibit with a touch pool where guests may pet stingrays. We had the best time as these marine creatures swam up to us, splashing occasionally, and allowing our fingers to gently brushed against them. There were squeals and lots of laughter as we all engaged in this activity. My husband is a huge fan of stingrays and he was thrilled to be able to pet them. My daughter was a little nervous about them, but she had a great time anyway. Even my teenage son had a great time. Throughout the zoo there were demonstrations of creative pumpkin carvings and various arts. My daughter enjoyed watching the iron making demo and she was fascinated the lady making glass beads. We were even able to take part in some activity like painting pumpkins and making soy candles. In addition to some of the demonstrations and activities, we of course enjoyed viewing several animals too. Not only did our family have a lot of fun together, we also utilized our local resources to save money. By purchasing a membership to the zoo, we have 365 days a year we can visit the zoo without a charge. Admission and parking are free and we if we decide to travel out of state we can receive discounts to other zoos. Out of curiosity, I decided to determine how much a trip for a family of four would cost a family. I calculated it at our admission rates $14.99 (12 and over) for 3 of us and $9.99 (child) for my daughter, plus parking at $7. A total trip without food (remember to pack a lunch for everyone and save money) would cost $61.96. Our membership cost $94 (we saved $5 by renewing online). In less than two visits, this membership has already paid for itself. I took my daughter to the zoo for a Mommy & Me and that alone would have been $31.98. There are many special events throughout the year that are fun for the entire family, so be sure to check out your local area attractions to see how you can maximize your dollar while still building memories with your family. Usually for a family of four, you can add about the cost of a single-day admission to a local attraction and get a membership for an entire year. If you love visiting the zoo or science museums with your family, a membership will usually save you a lot of money in long run although the initial cost is more. Plus having a membership typically gives you additional benefits and special member events. So if you want to make lasting memories for your family, consider saving a few extra dollars and splurge on the membership. It's that time of the year again, fall is upon us and to me that means mission to continue family traditions while creating good memories. We started our own tradition about four years ago. A wonderful lady I used to babysit for had told me a years ago that she was taking her children to pick apples. Living in the city, we don't really have a lot of local orchards so I had inquired about where and learned all about the farm. For the next couple of years, apple picking wasn't a priority. My daughter was born the following summer and taking a newborn, who screamed every time I put her in her car seat, to an orchard 45 minutes away was not high on my list of things to do. It was a few years later, when my daughter was older, I remembered about what this lady had told me and I wanted to take my children to this orchard. We picked a weekend when the apples best for cooking would be ready to pick and had invited my mother and father-in-law out to visit. My mother-in-law brought her canner and the plan was to make applesauce and apple butter. I had never canned before and needed someone with experience to show me how it's done. Canning kind of scared me because if it's not done right there is a potential to make yourself and family very sick. Off to the orchard we went to pick apples. The kids had a great time, the adults had a great time - it was a lot of fun and it was then that I realized I wanted this to be a family tradition. For the next few years, we returned to this orchard and during those times the apple prices remained the same - $16 for a half bushel of apples. I never thought to compare prices anywhere else because I was simply grateful to have an orchard within a reasonable distance that we could visit to pick apples. After checking the price at the orchard this year, I was surprised to see they were charging $20 for a half bushel of apple. That seemed like a drastic price increase and as we know I'm on a mission to save money, so I decided to do a little investigating to see if that was what all the orchards were charging. I found most orchards were not posting prices so I decided to email a farm that was a little further out and discovered they were only charging $9.50 per half bushel. That's over a 50% price difference. Sign me up! 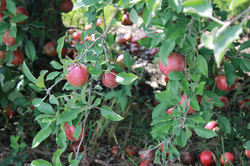 So we continued our tradition of apple picking, only this year we'd try a new orchard. Worse case scenario, we don't like it right? I knew this trip would last into lunchtime so I decided to pack a healthy lunch and some drinks so we wouldn't have to eat out. Off we went, on what was about an hours drive, to the new orchard. We were so happy when we got there - not only did they have apples to pick, they had a wonderful store front with all kinds of goodies. I spoke with the cashier and figured out how things worked at the farm. A few bags were acquired and off we went to the orchard. 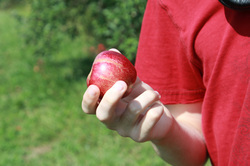 The kids had fun picking the apples. As always, my daughter climbed up on Daddy's shoulders to get the apples that are out of reach. There was lots of giggling and silliness as always. Lots of pictures and good times. After paying for our apples and loading everyone into the van, I asked my husband how far away we were from "Ye Olde Mill" - out came the iphone for a quick search and we discovered it was only a couple of minutes away. The unexpected surprise changed our course of direction and off we went to Ye Olde Mill. We were happy to discover all the great things there - a beautiful pond, several picnic shelters, a playground, a few farm animals, and of course the Mill with Velvet ice cream. We made our way over to the picnic shelter to enjoy the lunch I packed - nutella with banana slices on whole wheat bread, cheez-its, and raisins. During our lunch I was startled to discover an inch-worm had hitchhiked his way to Ye Old Mill on my shirt. 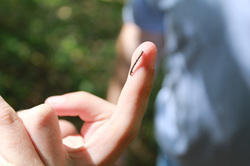 My son retrieved the little critter from my shirt and both kids admired it as it inched across my son's finger before he pAfter our lunch, we ventured off to get some ice cream - you can't go to the place where the make Velvet ice cream and not get an ice cream cone, it's just not right - and enjoyed the activities at the mill before returning home. Our family had a wonderful time apple picking and at Ye Old Mill. My husband and I decided that this would now be our new family tradition, apple picking at the orchard followed by a picnic and ice cream at the Mill. Even though my husband and I had our day filled with tasks of cleaning (I tackled the kitchen and he straightened his workbench in the basement) and running our own errands, I managed to get everyone together tonight for a couple of rounds of "Headbandz". My daughter received this game a couple of years ago from my mom for Christmas and she loved it. This is a good game for the entire family to play and it tends to bring about a bunch of silly questions and good laughs. It's nice to have the television off and have everyone gather around the dining room table to spend time together. I am still working on getting my new school routine in place, but I'm definitely working on reinstating family board game night. They say enjoy your children while you can, but we all know that as adults life gets in the way. We are overworked and stretched to our limits just to make ends meet while trying to survive in today's fast-paced modern life. I'm just as guilty as many parents of failing to really sit down and spend time simply playing with my children. Even though I may not work outside the home, I have more than enough to keep me busy managing our household. Don't get me wrong, we do spend time with our children. I guess I just think we need to change how we're doing things and make things count a little more. We always eat dinner together. No matter how busy we are, dinner is always shared together at the dining room table. My latest mission is to find ways to increase our family time. Yes, we take family vacations, visit the zoo, and sometimes splurge for a trip to the movies, but I'd like to see more time spent laughing and enjoying being a family. We used to have family board game night with my son one to two times per week before my daughter was born, but once we had a demanding newborn who grew into an energetic toddler - well you get the picture. Sitting down to play a board game became more challenging and over time it was phased out. Now my daughter is 7 years old, can read above her grade level, and enjoys the interaction as a group. Over the last year, we've been moving towards having more family board game nights, but it just hasn't become part of our regular routine. It really bothers me we don't spend more time playing games because we always have a great together and there's always lots of laughing. Family board game night is being reinstated. Every Friday night, our family will gather at the dining room table for a round of Apples to Apples Jr, Headbandz, or whatever else we have stored away in our closet. Spending time together is important and I value it. My children will value it when they get older and look back on the fun memories we're making. It's time to make time for that family night. This mission is on-going so I'll keep you posted on it's success.